Kick Plates & Push Plates are a simple, economical solution to protecting your existing doors. 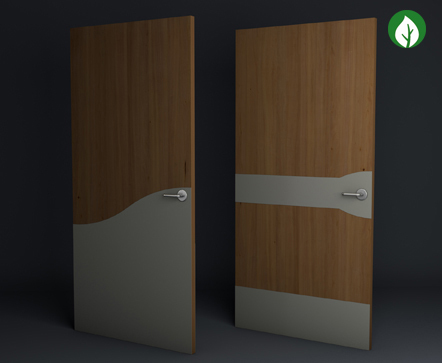 Providing vital protection to the most used, and most vulnerable areas of a door, kick plates & push plates absorb impact and abrasions so the door doesn’t have too. CS Acrovyn® Kick plates & Push plates are custom made to your specification from 2mm Acrovyn® sheet or 1.5mm PVC-Free Acrovyn® 4000 sheet. Any size, any shape, any position Acrovyn® Kick plates & Push plates make a feature of any existing door, whilst providing essential protection for the door, and your maintenance budget. Due to the limitations of print and computer screens, actual colours may vary. We recommend making any colour selections from our free of charge samples service. Approximate LRV values for CS Acrovyn colours and finishes have been determined using the CIE Y value measurement method. Note: Due to the thickness of Acrovyn sheet, it is recommended that kick and push plates are fitted between the door stops on the push side of the door.